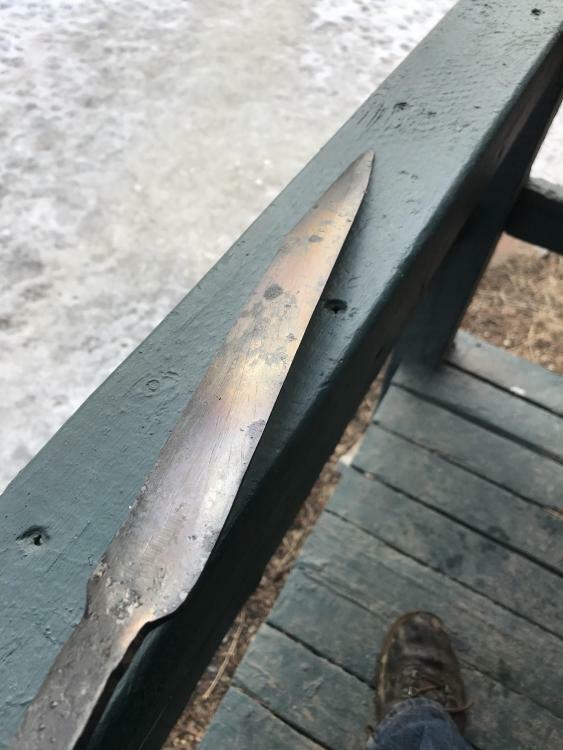 I’ve been building my first larger blade (at least the first one I actually intend to complete) and I’ve just finished my first heat treat outside of punches and chisels in over a decade. This is 5160 from a new coil spring, forged in bevels and done entirely by hand. I don’t have a grinder that is up to the task, so I’m doing it the hard way. Any advise is appreciated. I was attempting to reach a blue spine with a straw to brown along the edge, I did better than I expected using a heated bar to cook the spine. I also attempted to submerge the edge and heat the spine with a torch... I need a new map-gas torch now. Thing was clogged up and didn’t work well at all. 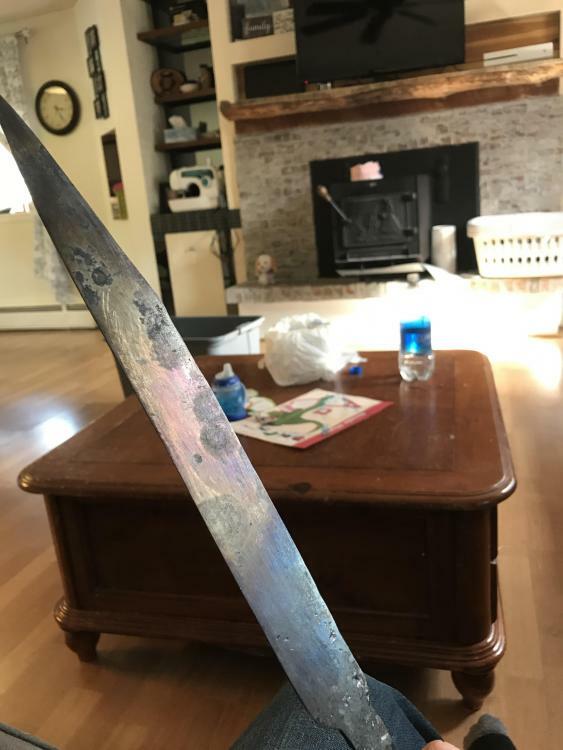 Is a 5160 blade tempered mostly to a brown or straw brown, with quite a lot of blue near the tang, and the back varying between a brown and purple going to shatter the first time I try to use it for something? What should I be trying to reach color-wise for a medium length 5160 chopper? I was attempting to replicate primitive methods to an extent. Files, forge, quench oil and time are my tools for this project. If it doesn’t come out well, no harm done. I’ve wasted nothing but my time and I’ll have learned something. Those of you using tempering ovens, or simply tempering in the oven, are you attempting a differential heat treat, or are you trying to get consistent properties throughout the piece? Seems like a larger piece would benefit from a softer spine and a harder edge. Good to see your web handle again! I'm no help with your heat treat question but I'm not about to let you post and not say hi! How are you and the family? My memory is too bad to recall your wife and little ones names. Where are our pictures?! Frosty! Great to hear from you man. We’re all doing great, have another baby girl about the same age now as my oldest was when you met her. I’m graduated and working as an engineer now and life is great! We move to a bigger house, still in the mountains and a lot closer to Denver. Leah, my wife is thrilled since it’s a 1940’s log cabin, and as an architect, it appeals to her aesthetic sense. My email hasn’t changed, it’s still the DickyPitts one. Shoot me whatever you’re using currently and I’ll send along some pics. How’s Deb? Pretty country, especially if you're a paleophile, I've loved dinosaurs since I was a little kid. Deb's doing really well, she's been teaching K 9 Nose Work for a few years now, her classes all have waiting lists. She bought a 1 year old 27' rental motor home with the proceeds. Maybe if the new wears off it she'll let me drive. I'm still just me, not as exciting as before the accident but doing well. Been getting things finished up in the shop a little at a time. Ran the bury power cable to it last summer and once my shop allowance builds up enough I'll get it hooked up. Almost no breakage in the earthquake: picture frames a couple coffee cups and only partially emptied shelves. We came through that in great shape, heck our well cleared in about 2 weeks even. The whole area including Anchorage and the bases came through with minimal damage for the magnitude of the quake. They're going to have to replace a couple schools here in the valley but they were darned old anyway. There weren't even major injuries, a broken leg in the quake. More people have been injured cleaning up and repairing things. What are you going to chop with it? Bone? Wood? Chicken? Elk?.... 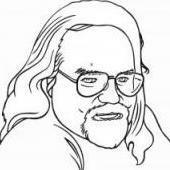 How does the edge react to a file? Have you looked into tempering tongs as a low tech method of replacing the torch? Immerse the edge and grab the spine with the hot tempering tongs. 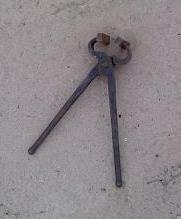 These were made from a set of pull offs with bars welded crossways on the end of the bits. Heat the bars HOT and can be done in multiple stages if needed. I would be most worried about getting an EVEN temper and not having it varying all over the place as a single brittle area will doom a blade that sees hard use. One trick is to set an oven to the lowest temper range you want and temper the entire piece at that before going back and drawing the spine to a higher temp "manually". It’s supposed to be a seax, so I would like to make it durable enough for camp use, shaving firewood, chopping brush, limbing small branches and trees etc. A file bites the edge just a bit, but doesn’t skitter off like it does on the bit of tang I didn’t wind up getting hot enough to temper. I’m going to have to anneal it and try again I think. Ah well, little more file work, now I know that tempering doesn’t scale up anywhere near as bad as getting the piece to forging heat. Thank you for the oven suggestion, I was wondering why people were posting about putting knives in the oven at 350 for hours, getting enough of a temper to prevent shattering prior to finishing sounds like good insurance. I had read about tempering tongs, just had forgotten. Thanks for the reminder, I might even have a pair lying around that have enough mass to get the job done already. Either way I have plenty of junk tongs laying around to play with. I’ll probably do this for safety if nothing else, would there have been a primitive method (like hot tongs) to get a consistent temper, or would it have just been a matter of experience? 2. Hot tong the spine after getting the whole piece to a consistent straw yellow to brown, as was the expected temper color for medium carbon steel at 360 deg from the old anvilfire website. I’ve got an idea of where to go next, thanks! When you consider the challenges to practical metal work through history, it's pretty amazing that anything was produced at all, much less the impressive pieces that are extant today. I imagine a real seax would have likely not been a mono-metal construction since steel was so scarce/valuable. 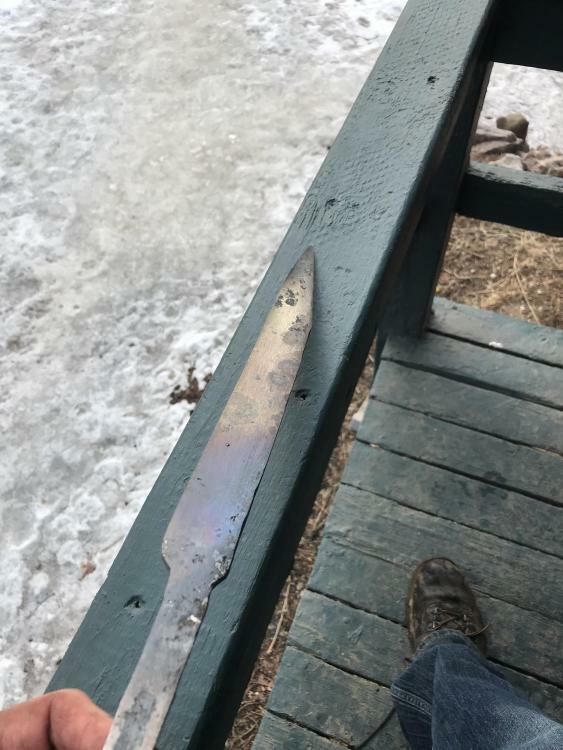 Most of the extant examples I've seen pictures of, appeared to be pattern welded; maybe from a wrought iron back with a steel edge, but I don't know for sure. I hear the silica in wrought iron makes it a lot stickier when you try to weld it. I've had minimal success with forge welds using mild steel. It's that experience thing again. Next time I'm going to try to file or grind my scarf to clean metal before I try to weld it, I must not be getting the surface clean enough with a wire brush. Olive oil boils at ~ 375 deg F at atmospheric, local pressure is around 11.3-11.4 psia at my altitude which would theoretically lower the boiling temperature. I can't find a latent heat of vaporization figure for olive oil so I'm not sure the exact amount it'll reduce the numerical value, but the idea does illustrate how a lighter oil could have been used to temper a piece. It also got me thinking about how the quench works from a physics standpoint. I guess the idea would be to try to remove heat at a fast enough rate to preserve some of the martensite crystalline structure, while allowing some interstitial carbon to migrate out and relieve stress and prevent shattering, the trick would be getting the heat transfer rate correct. 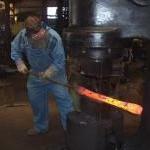 When people bake their metal at ~360-375 deg F for an hour, does the time factor alter the tempering as opposed to bringing a portion of the piece to the point where carbon starts to migrate and then immediately quenching it? I wonder if more carbon migration or crystal phase change occurs during an hours's heat cycle vs the minutes to seconds needed to do a heat & quench style tempering. i have no idea where you are getting your mis information, there is NO martensite to preserve before or during the quench. It forms from austenite because of the quench if its fast enough., also there isnt a measurable amount of carbon migration during tempering either. Guess I need to do some more reading. I thought martensite was the formation at critical temperature, and you were “freezing” it in place during the initial quench. I was wrong though. Not my direct area of expertise for sure. And martensite forms from the rapid cooling (quenching) of austenite. I read it, I even read it two days ago, prior to posting this thread. Just an example of pre-existing idea bias I guess. I can admit when I’m wrong. Just give it to him straight he can take it.